1. To be more organized and get some posts written ahead of time so I can spend more time with my family. 2. To spend one hour everyday writing my novel, excluding weekends. 3. Get rid of junk in the house. Time for spring cleaning. 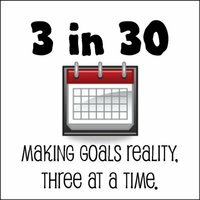 What 3 goals could you set every 30 days? They can be as simple or complex as you like! Goals For 2011 Ready, Set, Go! Hoarders Increase Your Joy In One Simple Step Tornado! Welcome to 3 in 30! I look forward to getting to know you throughout the year. Hooray! We’re SOOO glad you’re joining the #3in30 Challenge this month! !